One of the most serious slip and fall accident injuries is a broken hip, especially if the victim is a senior citizen. If you've recently suffered a pelvic fracture in a slip and fall accident caused by another person's negligence, you're entitled to compensation for your accident-related expenses. A pelvic fracture is a break in any of the bones that construct the pelvis. This includes the tailbone, sacrum, and hip bones (ischium, pubis, and ilium). Pelvic fractures can be classified as either stable or unstable. A stable fracture has one break point in the pelvic ring, with limited bleeding and bones that remain in place. An unstable fracture has two or more breaks in the pelvic ring and is accompanied by moderate to severe bleeding. Stable fractures normally have better treatment outcomes than unstable fractures. or falls from great heights, they can also occur after minor falls when someone suffers from a bone-weakening disease such as osteoporosis. A pelvic fracture can often be diagnosed by the symptoms the patient is experiencing, but doctors will typically order an X-ray or a CT scan to confirm the presence of the fracture. 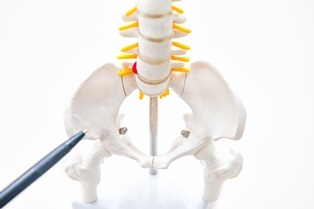 Treatment for a pelvic fracture depends on the severity of the injury. A minor fracture in an otherwise healthy individual may be treated with bedrest, prescription painkillers, and physical therapy. A more serious fracture will require surgery using plates and screws to put the pelvic bones back together. In the most severe cases, pelvic fractures can cause life threatening internal bleeding and damage to the internal organs. The property owner recognized or should have recognized the presence of a dangerous condition such as a spill of salad dressing on a restaurant floor, ripped carpeting, or a poorly lit stairwell; however, the owner did not take steps to address the problem. The property owner's actions directly caused an unsafe condition such as placing a hazard in a walking path. You must also be able to establish that your own actions were not the direct cause of the accident. For example, if you ignored a wet floor warning sign or were engaged in horseplay at the time of your accident, you would likely be found to have caused your own injuries. If your actions were only partially the cause of the accident, you can still receive compensation in a personal injury claim. However, Louisiana law will proportionally reduce your settlement by your assigned percentage of fault to reflect your own liability for your injuries. The best way to protect your right to compensation is to retain the services of an experienced personal injury attorney. Your attorney can gather evidence to determine liability, document your damages, and negotiate with the defendant's insurance company on your behalf. This will allow you to focus on recovering from your pelvic fracture and regaining lost mobility.